What is precision agriculture now and how does it affect our food quality? Agricultural sprayer perforing variable application of fertilizer over freshly planted crops. Precision agriculture has become a hit and we have yet to see an impact on food prices. Agriculture, while known for its inefficiencies and state subsidies, is being impacted by the technology revolution and becoming a high-tech enterprise. So what exactly is the precision in agriculture? How does it affect the food production and the food we eat? Can we taste it? The industrial age brought about a revolution in the efficiency of farming large plots of land. Tractors and automated machinery helped farmers plant and harvest hundreds and thousands of acres of farmland each season. These advances brought cheaper food to our tables . They also caused farmers to become reliant on government subsidies as food production exceeded demand and lowered food prices so much so, as to make farming unprofitable. This also led to the demise of family-owned farms since farming small plots of land became unprofitable even with the help of government subsidies. While the quantity of food in our stores increased and food prices decreased, the quality of produce was significantly affected. Tomatoes no longer tasted like tomatoes and a generation of kids stopped eating vegetables. The reason was simple. While machines enabled farming production to expand, the scale of production did not permit farmers to take into account variations in soil quality, moisture variability and local micro-climates which are necessary to get high quality produce to grow. What was once matter of fact for small family farms, now became lost. The farmer and agronomist lost touch with the ground under their feet and were barely keeping pace with the machines that revolutionized their industry. To survive, farms were forced to focus on quantity rather than food quality. With the advent of the information age, the term "Precision Agriculture" was coined. Taking a closer look at the farm industry and its history, one quickly realizes what it really means. It is the return back to the family farm values. The precise use of resources and understanding of the soil under a farmer's feet. It is the understanding of local weather and its micro-climates to achieve healthy and tasty crops with minimal use of fertilizer, pesticides and herbicides. Precision agriculture is the return to the farming precision of small family owned farms which existed for hundreds of thousands of years before the first tractor ever revved up its engine. 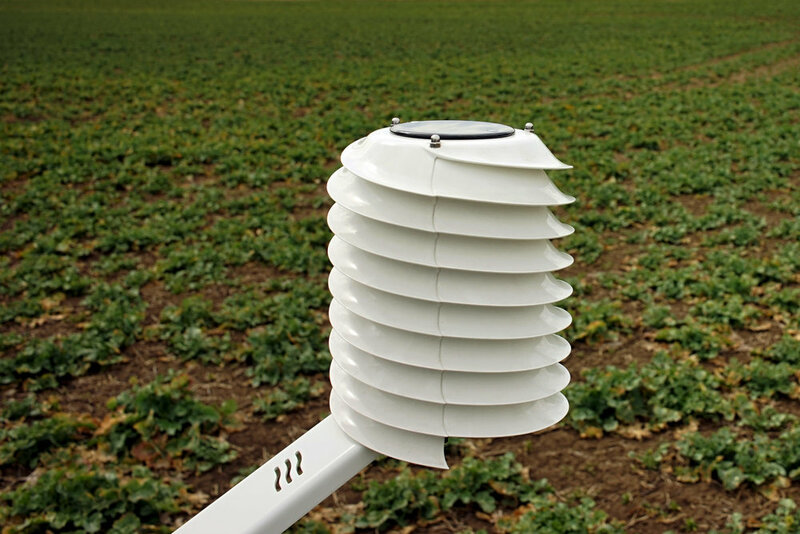 micro weather station MeteoHelix IoT over a crop field. Drones and automatic weather stations are synonymous with the term "Precision agriculture." So how do they really contribute to the quality of food that we see on our tables? Application of weather stations can be seen as the first step in precision agriculture and dates back decades. Understanding of weather and comparing seasonal variations in rain amounts and temperature levels were the baby steps that enabled farmers to adjust irrigation and fertilizer levels to achieve healthier crops. The dawn of the Internet-of-Things (IoT) and new sensor technologies like the helical solar radiation shield for temperature sensors achieve new levels of measurement precision and repeatability which enables detailed an accurate analysis of meteorological data and permits farmers to adjust irrigation and fertilizer multiple times a season to achieve a balanced yield and healthy crops. Complemented by the use of drones as sensor carriers, farmers are able to get an eagle eye view of crop health and variability without stepping onto every square foot of their fields. Drones carry multi-spectral cameras which, instead of taking one color picture, take multiple images of the same scene each in a different color, uncovering crop and soil variations not visible to the human eye. Soil moisture and temperature monitoring along with these images are processed into colorful maps and presented to the local agronomist and farmer whose place in precision agriculture is firmly grounded. Only they know the land well enough to interpret the results in the context of their farm and bring tasty food and produce to our tables. Agricultural drone surveying with a multi-spectral camera and leveling mechanism. GPS technology and tractor automation enable precise application of fertilizer, water, and pesticides to significantly minimize their use. Savings are achieved not only from reduced use of farm chemicals and water, but also higher profits are gained from a more balanced yield and healthier crops at the end of the season. Detailed weather and soil monitoring reduces crop disease risks and prevents crops from drying or over watering. Precision agriculture is the return to family-farm precision on a larger scale to bring healthy and tasty crop to our tables with minimal use of pesticides, water and fertilizer. It enables farmers and agronomists to apply detailed land and climate knowledge to keep pace with the ever efficient farm machinery. It empowers small farms to be efficient and large farms to focus not only on quantity but on quality of their produce.